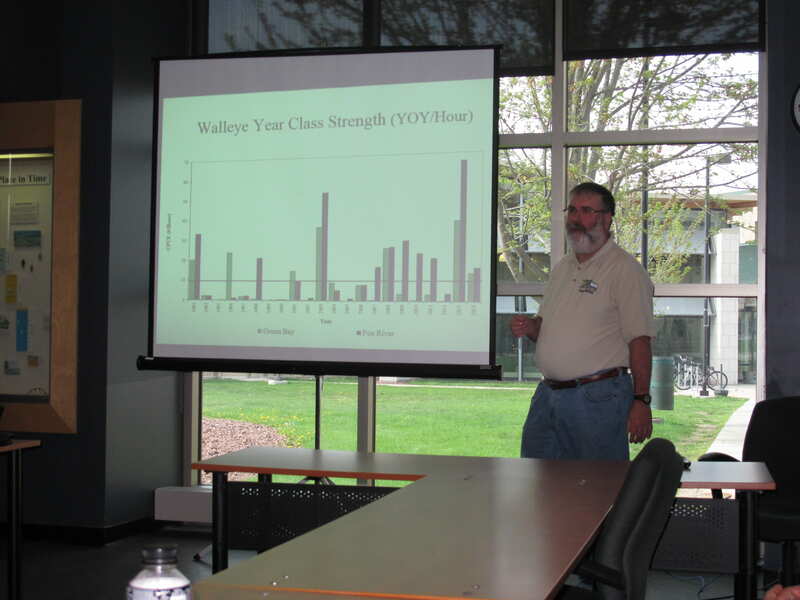 On May 7th, our guest speaker was Steve Hogler, a fisheries biologist with the WI DNR. Steve has worked for the DNR for quite a long time, and his work focuses on Green Bay Fish Management. He manages the waters of Manitowoc, Kewaunee, Brown County & Door County tributaries, and lakes & waters of Green Bay, both inland and offshore areas. 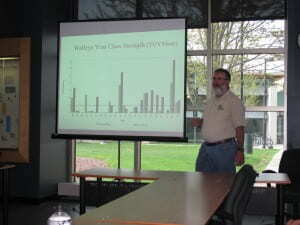 He is also a large part of the Green Bay walleye and muskellunge assessments and management practices. Some of the management issues Steve is faced with and working to improve include: habitat destruction and loss, water pollution, unregulated fishing practices and invasive species management. A main focus of management is restoration of fisheries, specifically native fish. This involves stocking and habitat restoration and creation. In regards to walleye populations, they were stocking millions of walleye fry and fingerlings about four decades ago. Within 10-15 years, the populations had started reproducing naturally, and so they stopped the stocking efforts. The DNR also creates spawning reefs for walleye, and this has proved to be a very successful method is maintaining their populations. To monitor walleye, they do spring and fall YOY assessments, spring tagging of spawning adults in Fox River and tributaries, and creel surveys at relevant fishing locations. They recently started a floy tagging program to help determine if walleye return to the same rivers to spawn, as well as see where they go between spawning periods. The spotted musky management and monitoring program is quite similar. The DNR does spring netting to embed a PIT tag, as well as collect eggs and milt for hatchery rearing. They also do spring and fall electroshocking and take creel surveys. From a broader aspect, there are over 60 species of fish in the Fox River. This is a great sign of improvement, yet there is still a ways to go in terms of water quality and habitat availability for these fishes.